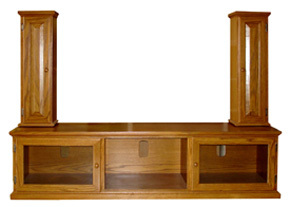 This oak media center is the perfect way to show off your TV. The attached cases on top are made to store your TV’s speakers and are available with solid wood or speaker mesh doors. As with all of our entertainment furniture, everything can be built and finished to your specifications.